I received an e-mail from Fictionista Workshop & I just had to share it with all of you. I think what they are doing is WONDERFUL & SO needed. Please have a read through what they have to say & contact them if you want to feature them on your blogs, too. Their website is http://www.fictionistaworkshop.com/ . Right now, they only have their introductory post up, but when they launch, they will be issuing a call for applicants that are writers, editors and contributors to apply for participation in the workshop experience. I am contacting you on behalf of Fictionista Workshop, a burgeoning writers workshop for creative original fiction. A thriving, supportive community of writers, editors, and readers. Women who enjoy the online writing and reading communities are eager for creative opportunities in which they can interact with others, for a variety of reasons. Writing can be a lonely process, whether done in private or with others; having a ready pool of other writers, editors, and readers available for immediate discussion and feedback when needed can be extraordinarily helpful. We believe there is a true need for education, development, and resources that transcend the unfortunate and inaccurate stigma often given to the fanfiction genre and enable writers to move into the writing process with confidence based on their education and experience. Fictionista Workshop desires to affiliate with community leaders and organizations that house creative fanfiction from all aspects of the Twilight community. We have many members that enjoy your community and were referred to you by one of your blog followers. As part of our fiction production and love for writing, this includes our love for Jasper fanfiction! 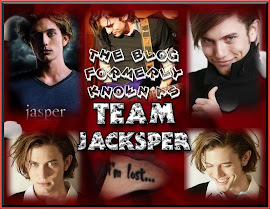 We look forward to many authors from the fanfiction side of our workshop to focus on Jasper Whitlock Hale and are requesting your affiliation. Thank you kindly for your consideration. If there are any questions or comments, please feel free to contact us. Either way, thank you for operating an outstanding quality community for Twilight fanfiction community writers and readers. Please go support them - they are doing fantastic work! Thanks! Thank you so much for linking Fictionista Workshop! We are pleased to affiliate with such wonderful bloggers in this community! We look forward to working with you in the future!